These are the stages of the brief and epic life of your average Mulfin, usually in that order. Until recently, these repugnantly beings were nothing but walking acid bags; until the glorious day an enraged Tyrannizer dad threw his son's entire Mulfin collection against a nearby mountain. The resulting explosion caused a huge hole in the rock. From that moment on, Mulfins stopped being considered brainless and grimy bugs: they became the brainless and grimy long-range ammunition of the Orc Nation! B-Sieged is a fully cooperative castle defence board game that combines exciting combat action with strategic resource management. In this thrilling defensive battle, 1 to 6 players control the mighty Heroes of Modhelm, who must hold out long enough for the Messenger to return with a powerful magic artifact that will break the enemy siege. 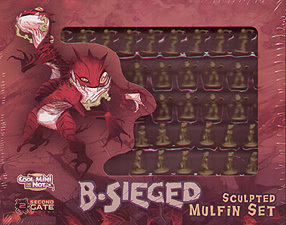 This Sculpted Mulfin Set replaces the Mulfin tokens that comes in the B-Sieged Darkness & Fury Expansion. Requires B-Sieged: Sons of the Abyss and B-Sieged Darkness & Fury to play.